Healthcare Senate 2016 which took place from September 22 – 24, 2016 in Hyderabad was one of the largest gathering of the Who's Who from India's healthcare industry. Healthcare Senate 2016 which took place from September 22 – 24, 2016 in Hyderabad was one of the largest gathering of the Who's Who from India's healthcare industry. Healthcare Senate also hosted the Express Healthcare Excellence Awards celebrating the spirit of excellence and leadership in healthcare delivery in the private sector. P. D. Hinduja Hospital and Medical Research Centre was conferred with Express Healthcare Excellence Awards 2016 under the category 'Patient Care'. 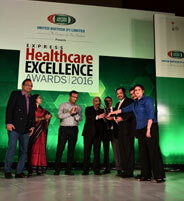 Delighted on being bestowed Express Healthcare Excellence Award 2016 for Patient Care, Mr. Gautam Khanna, CEO, P. D. Hinduja Hospital and Medical Research Centre said, "We would like to thank the organizers and jury members for recognizing our efforts and leadership role in providing and delivering patient centric world class quality healthcare services. Each and every staff member of our hospital works relentlessly to deliver the best quality patient care at the best value. This award symbolizes P. D. Hinduja Hospital and Medical Research Centre's six decades of selfless and passionate service of providing quality healthcare to the people of the society." Receiving the award, Mr. Joy Chakraborty, COO, P. D. Hinduja Hospital and Medical Research Centre said, "At P. D. Hinduja Hospital and Medical Research Centre, patient care is at the center of everything we do. It is a proud moment for me and the entire team at P. D. Hinduja Hospital and Medical Research Centre as this award further reinforces our dedication to quality patient care. It is a testimony of our hard work and commitment to provide outstanding patient care and a motivation to continue striving to achieve our founder's vision of providing quality healthcare for all." Express Healthcare Excellence Awards 2016 were divided in five different categories - Innovative Marketing Practices, Inspirational Workplace, CSR, Patient Care and Health Tourism. The award entries were evaluated by Ernst and Young and a five member jury from the healthcare industry.